Card Text Play: Deal 2 to a creature. If this damage destroys that creature, steal 1 . 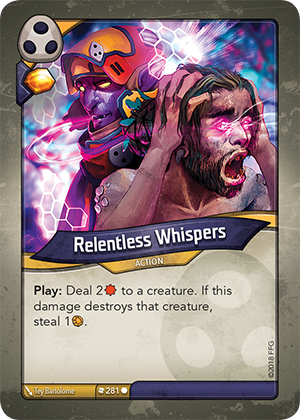 Can I play Relentless Whispers if there are absolutely no creatures on either battleline? Yes. No damage is dealt and no Æmber is stolen. You still get the Æmber bonus that is shown on the card. Can I play Relentless Whispers if my opponent doesn’t have any creatures? Yes. If possible, you must still deal 2 damage to a creature, even if it means your own creature. If this creature is destroyed, you steal 1 Æmber from your opponent.